I must admit that when I first heard that German metal veterans Accept would start over again without original singer Udo Dirkschneider, I was sceptical to say the least. I remember how their whole career was smashed to pieces the last time they tried that. The album, Eat The Heat (1989) was a failure, both musically and commercially and their singer, American David Reece was a really good singer, but didn’t fit the band at all. In my mind, Wolf Hoffmann (guitars) and Peter Baltes (bass) hadn’t learned anything from that experience, it seemed. Udo Dirkschneider was far too important for both Accept’s sound and look and he could never be replaced. It didn’t make things better that his replacement was Mark Tornillo, the lead singer of T.T. Quick, a melodic hard rock band that was obscure, to put it mildly and was only known to a few rockers because of their cover version of Dave Clarke Five’s 50’s hit “Glad All Over”. Boy, was I wrong. When Accept finally released their come back album Blood Of The Nations (2010), they didn’t only floor me, but almost every old Accept fan would agree that Accept had made one of their best albums of their career and that it sounded like a true Accept record. Mark Tornillo also won everybody over and today he is 100% accepted as the lead singer of Accept. The fact that Udo isn’t missed at all is an astonishing achievement. I mean, Udo Dirkschneider is a metal icon, for chrissake! The 2012 follow up Stalingrad didn’t match its predecessor, but it was still a very good album, albeit a bit rushed. But it did strengthen their position as a first class act and live they still drew a big crowd on the tour that followed. Their concert at Sweden Rock that year was extremely crowded and it sure looked as they could have headlined the whole festival. With two strong and well-received albums in their pockets, expectations for their – very important – third record were, of course, very high. And expectations didn’t get any lower when Hoffmann announced that their new album would be back to basics, to the sound they had on albums like Breaker (1981) and Restless And Wild (1982). Splendid news. That said, I think both of the Tornillo-fronted albums are back to basics and classic Accept, both in sound and song structure. When I first heard the first single “Stampede”, it took me back down to Earth for a while. While the song is a good song, it didn’t convince me the way I hoped it would. It has all the classic Accept ingredients and the intro creates big expectations, but the song don’t really go anywhere and the chorus falls flat. And I don’t hear any 1982 on it at all. This was ominous and not what I had expected. Still I looked forward to the release of the album and when the day came for me to take a listen, I did it with my fingers crossed. “Stampede” opens the album and I could state that I actually like the song, but it didn’t exactly grow on me. I still can’t shake the filler alert. But everything sorts itself out already by the second song “Dying Breed”. The song is magnificent and sounds like a mix of Metal Heart and Blood Of The Nations. Lyrically it feels a bit weird that a veteran metal act like Accept name drops some of their heroes’ song titles from the likes of Motörhead, Judas Priest, Saxon, Rainbow, Led Zeppelin and more. Usually, this is a stunt pulled by younger bands, but I love the feeling of old, successful rockers that still are fans. “Dark Side Of My Heart” is another killer. With a chorus that is melodic heaven, Accept takes us back to their more “poppier” moments on Restless And Wild or Breaker. With “Fall Of The Empire”, I’m on a time machine back to 1985 and Metal Heart and I love it. It’s a classic Accept tune with a classic melody that sticks to your brain like glue. “Wanna Be Free” has a metal foundation, but it goes heavily into pop territory, this is one the most pop oriented songs Accept has ever written. Any good, then? You bet it is. That melody will be stored in your memory bank for a while, I assure you. “200 Years” is another killer that sound wise takes us back to the Balls To The Wall (1983) album, one of the best metal albums ever. Do I have to point out that the song is brilliant? “From The Ashes We Rise” is another Restless And Wild type of song and the brilliant “Final Journey” that ends the album sends out big Breaker vibes. It’s a hard and fast rocker and a perfect album closer. It could also be a great show opener. 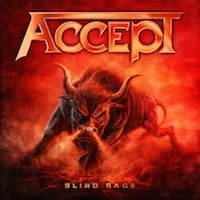 That my opinion is that Accept has recorded one hell of an album is something you might have guessed by now and yes, they have done just that. This is really close to a 10/10 review and “Stampede” is actually the only reason it won’t get that. Why on earth they had to do an Iron Maiden and release the weakest song as the leading single is beyond me. Also, the talk of them going back to the sound of Breaker and Restless And Wild is also slightly exaggerated – on a few tracks, yes, but I hear more Metal Heart and Balls To The Wall, to be honest. But those are bagatelles. The fact is that Accept has made one of their finest records of their career with Blind Rage and easily their best since Metal Heart. All the classic trademarks are here, the razor-sharp guitars, the big melody arrangements, the catchy choruses. They always have those elements on their albums, but on here they are more prominent than ever. What also strikes me is Wolf Hoffmann’s ability to write all those memorable riffs and hooks after all these years. To pick out one favourite song here is almost impossible because every time a new songs starts, that one is the favourite one. If there is anyone out there that still doubts that Accept are back for real without Udo, take a listen to this album – this is the final proof that they are! HELL YEAH! I’ll have to check CD Japan for bonus tracks. You should see the last parcel I got from CD Japan. I am glad to hear about the melodic quality to this album. I like the last two very much. I know I’ll love this one too. What was in that parcel, Mike? I haven’t heard anything about bonus tracks for this one, but Accept has always been big in Japan so I guess there will be some bonus stuff on it. If you loved the other two, you’ll love this one too. New Winger, Japanese with bonus track. Also the two most recent Whitesnake live albums, Japanese with bonus tracks. I dunno Jon. For some reason i cannot get Into Accept anymore,why I don’t know could be my last purchase was back in 1989 with Eat the Heat!? ?…hahaha…I’m glad there still going but for me I’m ok with Balls and Metal Heart. But good on em! Dude, you’re missing out. Eat The Heat was crap, but Accept of today are as good as they were back then. Why not give this a shot and decide afterwards instead? Yes, I’d suggest you do that. I think you might get really surprised. And I’d suggest that you check out all three of the Tornillo-fronted albums. Yes! I’m loving this one. I think Accept’s return has been a phenomenal feat. I felt the same about Stampede but it’s grown on me now. The guitar work saves it. Actually the guitar work is phenomenal on the whole album. The only track that I don’t care much for is We Wanna Be Free. I like the tune but it’s just a bit too wet for my liking. But it’s a brilliant album overall. I love that they went back to the melodic 80s style. Hey Scott, what do u mean by “too wet”? It’s more the lyrics that bug me with that one. By “wet” I suppose I mean just a bit too sentimental… Why can’t we all just get along? Why does the world have to be so bad? Boo hoo. I’m being a bit harsh but it’s just the only bit of the album that isn’t as good as it could have been. And its a catchy enough tune even with the ropey lyrics.